The gold and silver markets are struggling to regain their footing as investors focus less on the potential for conflict in Ukraine to escalate and worry instead about the end of the era of Quantitative Easing and Zero Interest Rate Policy. Prices for both metals did rebound slightly on Friday after a second consecutive week of heavy selling. Some follow through to the upside early this week could get a rally going. Otherwise, silver could test major support near the $19/oz level in the days ahead. The takeaway for long-term investors is that silver anywhere below $20/oz is a fantastic buying opportunity while it lasts! Gold and silver opened basically unchanged today in the U.S. on te final trading day of the third quarter. This week's jobs report figures to weigh heavily in the metals markets. A strong report may lead to lower prices, as it will raise the odds of more Fed monetary tightening. But a disappointing report will almost certainly push metals higher. When Do Fractional Sized Coins Make Sense? Interest is growing in fractional-sized coins and rounds. Money Metals Exchange recently added some of these products to the lineup -- including Gold Maple Leafs and Kangaroos in 1/10, 1/4 and, 1/2 ounce sizes. We also added a new silver item: 1/10th ounce Walking Liberty rounds. First off, buyers should understand why the premiums to buy fractional products are higher. While Money Metals' premiums are generally lower than the competition across the board, they must include fabrication costs and/or wholesale premiums we must pay to acquire inventory. Fractional-sized coins carry more premium because the cost to manufacture something like a tenth-ounce round approaches the cost of minting a one-ounce round -- a product containing 10 times the metal content. Fractionals offer more flexibility if the metal is ever needed for barter and trade. Imagine going to a yard sale with a pocket full of one-ounce gold coins. Not very practical if you're just looking for a toaster or table lamp. You'll surely be glad to have some metal in small denominations. Fractionals offer more affordability. Particularly when it comes to gold. Many customers want to own some gold, but not all want to spend nearly $1,350 for a one-ounce coin or bar. And some argue this dynamic will favor even higher premiums for fractional products when metals prices rise. Fractionals are easier to conceal. Fractionals may be more appropriate for gifts. If any of the advantages above are meaningful to you, you should strongly consider adding smaller denomination items to your holding. If not, save the premium and just buy one ounce (or larger) products. Until recently, investors looking for fractional silver for sale focused almost entirely on one product -- 90% silver U.S dimes, quarters, and half dollars, often referred to as “Junk” silver. Premiums for these no-longer-minted coins are much higher today than in recent years. With silver at $20/oz, there are lots of buyers of junk silver, but not many sellers. Learn how to buy junk silver online, so then you can start investing today! Dealers have been looking for alternatives to offer. Enter 1/10th ounce silver rounds. Along with more competitive premiums, these rounds come in brand-new, brilliant uncirculated condition, meaning they are much prettier than circulated 90% silver coins. They are also a bit easier to understand as they require simple math to value... the melt value of a tenth of an ounce of .999 fine silver can be calculated easily in your head. 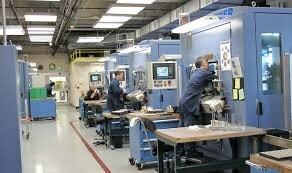 Tuesday, April 1st - ISM Manufacturing Index. Consensus is calling for a slight uptick in manufacturing activity as the effects of difficult winter weather begin to fade.